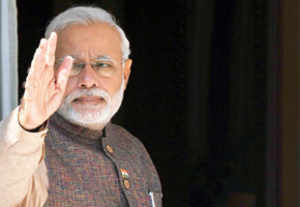 NEW DELHI: Prime Minister Narendra Modi has asked his ministers to lay emphasis on overall governance, efficient delivery and implementation. Chairing the second meeting of his Cabinet on Thursday, Prime Minister Narendra Modi outlined the top 10 policy priorities for his government. The Prime Minister asked his ministers to fix a timetable of priorities for the first 100 days. To send out a similar message across the country, Modi is likely to address the nation, possibly after the brief Parliament session that would be convened from June 4 to June 11 during which President Pranab Mukherjee will address the joint sitting outlining the government's agenda. Sharing details of the meeting, parliamentary affairs minister Venkaiah Naidu said the Prime Minister will meet his ministers and secretaries separately to discuss all important issues. The Prime Minister has also asked Cabinet ministers to allocate work to their respective ministers of state, Naidu said. Believing that the progress of states is crucial for the country's development, Modi also instructed his council of ministers to give priority to the issues brought forth by the state governments as also the MPs. Last edited by swami; May 29th, 2014 at 04:25 AM. Yaar Insey bolo kuchh dhoom-dhadaam ka policy/order announce karo. School ke Teacher aur Student jaisa homework na start karo. Bahut heavy backlog hai......sirf baato se kaam nahi chalega. tumhare jaise congressi log so rahe the jab 10 saal tak na order na policy na homework ho raha tha? dumb people dont realize one has to take stock first of how many fires happened in PMO and how many files are missing..
NEW DELHI: Even before the new finance minister gets down to preparing the next budget, he has to grapple with unpaid subsidies of at least Rs 1 lakh crore left behind by the UPA government. While the food subsidy bill accounts for almost half the amount with unpaid subsidies adding up to over Rs 50,000 crore. Then, there are dues of Rs 38,000 crore to fertilizer companies and another Rs 24,000 crore to public sector oil marketing companies, which sold cooking gas and kerosene below the international price. There are also additional taxes that the government had mopped up from companies in its bid to meet its ambitious tax targets, and show healthier finances, which now need to be refunded, with interest. Tax department officials, however, said that companies were not coaxed into paying higher taxes and refunds were not stopped. While economists and corporate chiefs have been critical of the UPA leaving behind a large liability for the new finance minister, finance minister P Chidambaram had said that these payments are for the fourth quarter of the 2013-14 financial year, which are to be paid this fiscal. Officials dealing with sectors that have been hit as government didn't clear dues are, however, complaining that the held back payments are resulting in the companies having to borrow from banks to meet their cash requirements. In fact, they are severely critical of the Manmohan Singh government's subsidy policy, saying that the government burden was transferred to oil and fertilizer companies in addition to the Food Corporation of India, rendering many of them financially unviable. In fact, during UPA 1, the finance ministry had resorted to issuing bonds to oil and fertilizer companies, which were not explicitly shown as subsidies and had faced stiff criticism as the system was not transparent. But thanks to the unexpected 3G bonanza in 2010, Pranab Mukherjee cleared the dues, although some of the companies had to take a hit. Even during UPA-II, transparency was often missing. Under pressure from the rating agencies, the government sought to cut down on spending to show a healthier fiscal deficit. The government has budgeted for fiscal deficit of 4.1% of GDP for 2014-15, compared to 4.6% last year. But if the government had budgeted for the over Rs 1 lakh crore outgo last year, the number would have been vastly different. As reported by TOI on Friday, several ministries, including finance, fertilizer and petroleum are going to make a fresh pitch for a reduction in subsidies by focusing only on the poor. Auction 4G spectrum and pay those bills. smart ASSES are going to find something to blame Congress again instead of doing something good for country wise development. Same drama going to start to "TU CHOR-MAI CHOR-TU CHOR." see boss pessimistic people will find anything to cling to within not even 2 weeks of govt formation.. to turn the tide it takes time and hard work which has begun.. already rupee doing better against dollar, with a good proactive RBI and simple initiatives of fixing taxation this govt will do good work.. wait and watch. 2 Remove all petroleum subidies and surcharges too. Slightly cheaper petrol but much costlier diesel, LPG and Kerosene. 4. Build ATMs that read fingerprints and disburse 50% of the amount saved in 1, 2 and 3 in cash. one can withdraw say, 1000Rs every month. The same fingerpriont cannot withdraw twice every month. 5. Reduce Income tax to 10% for the top slab. Then you will autonmatically see black money pouring back into the country. 6. Open govt matka dens and betting centres. Those who pay an income tax of over 1 lakh could be allowed there. 7. Pay the betting revenue accumulated to the sports teams if they win. 9. Designate one island in Andaman and Nicbar as a special tourist zone. Ganja, Laundiayabazi, Laundebaazi, everything would be legal there. Bas - Is that not enough. 2.) will make everything costlier - right? 4. )How will withdrawal only once from an ATM help? that too only upto Rs 1000? I agree with 9.) - that will be fun. Actually i forgot to mention. Reduce indirect taxes also. So, 1 and 2 are just means of transferiing taxpayers money to mango people by a large mai baap sarkar. i am just directly transferring the money directly. 1000 is an indicative amount. Lets say 4 Lakh crores is saved in one year. dividing it among 80 crore adults would lead to 5000 per annum or 200 per month. May be small to you but for a daily wage worker it is a lot. And only those who really need it would stand in the line or walk some distance to get it. No BPL cards or else needed. The price rise would be one time. There will be no continuous inflation which is triggered by the deficits. And if petroleum prices come down internationally, the prices come down here too. me thinks govt must enforce that all stores which have electricity (except food carts/thela, roadside pavbhaji, paan stall, etc) and companies have to make electronic transactions connected to a live system. That will bring in lots of tax money to govt, and help keep people honest, help in analytics, better management of products and resources. If you have seen any gas station cash register in US, say speedway, it is connected to speedway's servers which record every transaction. Even if its a cash payment, it is recorded, so scope for black money or illegal stuff is almost nil. Of course you need 24x7 electricity and many more things to achieve this.